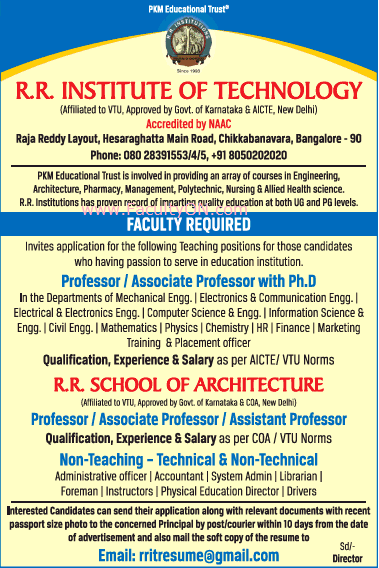 R.R.School of Architecture, Bangalore has advertised for the recruitment of Professor / Associate Professor / Assistant Professor Plus Non-Faculty jobs vacancies. Interested and eligible job aspirants are requested to apply within 10 days from 21st November 2018. Check out further more details below. About College : RR Institute of Technology (RRIT) was established in 2008 with the approval of AICTE, New Delhi, duly recognized by Government of Karnataka and affiliated to Visvesvaraya Technological University Belgaum. RRIT is focused on creating versatile professionals who can apply their knowledge & skills anywhere in the world. The academy has since its inception built a formidable name in the field of technology. How to Apply: Interested and eligible candidates are requested to send application along with CV, copies of certificates and recent PP size photographs to the following postal address as well as email address.